Indigenous readers please be aware that this page may contain the names of deceased persons. Once again Twitter brings me news of a great book to read! Thanks to @UQPbooks, I discovered yesterday that the 2014 winner of the David Unaipon Award has just been released. And when I realised what it was about, I just had to have it… Yes, *blush* I succumbed to buying it for my Kindle, so that I could begin reading it straight away. Many would agree that “a fair day’s work deserves a fair day’s pay”, and that whether you’re black or white, everyone should get paid for their labour,’ […] Not to receive all of your wages or savings for an honest day’s work is an injustice for any worker, regardless of skin colour. 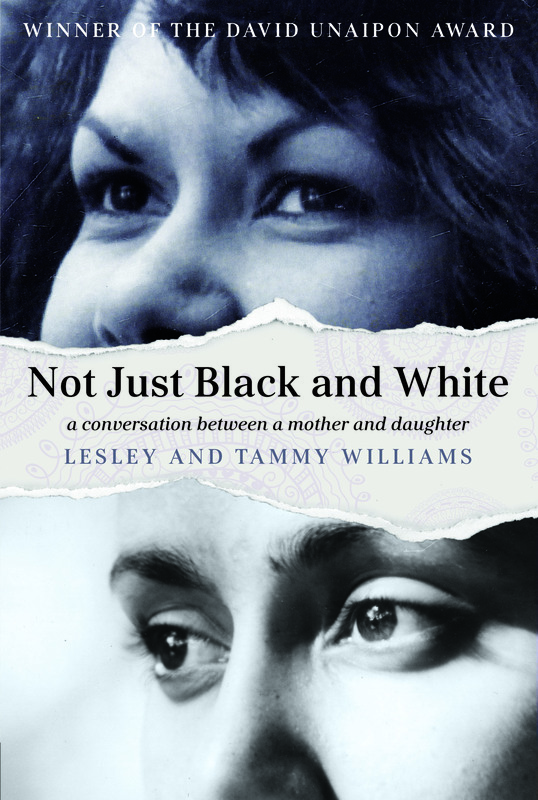 Not Just Black and White by Lesley Williams and Tammy Williams, University of Queensland Press, 2015, Kindle locations 3449-3456. The 1897 Act and the subsequent amending Acts of 1901, 1927, 1928 and 1934 gave the Chief Protector of Aboriginals, as well as the individual Protectors, enormous control over almost all aspects of the lives of Aboriginal and Torres Strait Islander people in Queensland, and vast quantities of records were created on the thousands of individuals who were subject to this legislation. Far from the stereotypical view of Aborigines being welfare dependants, these Aborigines who worked as stockmen, shearers and labourers, or as domestic servants, as Lesley Williams did, contributed to the development of Australian pastoral and agricultural industries for over a century, under a system which sequestered the wages of the Aborigines. Under this system, girls like Lesley were trained for domestic labour at the Cherbourg Mission and as teenagers were sent away from their families to work. Under the terms of the contract, in which Lesley had no say, it was up to the discretion of her employer to pay ‘pocket money’ and the rest was, by law, required to be deposited as ‘savings’ in a state-owned bank account. But no passbook was issued, and none of the ‘savings’ were ever returned to the person who’d earned them. When Lesley as a middle-aged woman finally got access to the records about her own life, she discovered that her wages were levied to pay for their second-class lifestyle at the Cherbourg mission: their rations, building maintenance, sewage, running the training farms, restocking the shelves at the store, and medical treatment. they kept a portion of her Child Endowment entitlements – paid by the federal government to low-income families, both white and black, to help with the cost of raising children in Australia. Her endowment money would later be added to the state government’s own coffers. Then the white officials had the audacity to hover, watching for signs of neglect, waiting for a reason to remove us from her care. But Granny – dear old, determined Granny – never allowed it to happen. She was not going to lose us the way her mother lost her. There’s an interesting pie graph and accompanying text at the Queensland Government’s web page about this: IMO it raises more questions that it answers. If it’s true that from 1943 some of the missing money went into an Aboriginal welfare fund, how was that money spent between 1943 and 1966? Until 1966, a percentage of Aboriginal workers’ wages were put into the Fund. Workers either had 2.5%, 5% or 10% of their wages taken, depending on family circumstances and their location. Why should Aboriginal workers have had to pay income tax like everybody else to pay for the general welfare system that anyone eligible could access, (widow’s pensions and so on) and then pay more for Aboriginal welfare? And what was this extra welfare that justified them taking away child endowment? This is not a misery memoir: while Not Just Black and White does document how shabby their lives were, it is more of a testament to a fighting spirit that Lesley Williams didn’t know she had. In telling the story of her life, the book shows the emergence of a courageous determined woman who transcended the circumstances of a difficult life. The author shows very clearly that she and her family were not looking for handouts, just access to their own money that they had legitimately earned. And as we can see from the example of her daughter’s success at school and becoming a barrister – with access to education and the widowed mother’s heroic efforts to be financially independent to support her three children – the next generation could and did achieve on equal terms in white society. The reason for the title is that Lesley Williams acknowledges both good and bad amongst the white people in her life, as well as admitting that some Aborigines didn’t help the cause and tried to sabotage her daughter’s success. Lesley acknowledges that in some ways she was ‘lucky’ because her last placement before marriage was with a wonderful Brisbane woman called Andrée Roberts who treated her not as a servant but as a friend who helps around the house. Mrs Roberts refused to sequester her wages, insisted that Lesley have time off that she was entitled to, supplemented her wardrobe, hosted her 21st birthday party and took her on family holidays. This woman also boosted Lesley’s confidence and educated her about her entitlements, gently bridging her ability to interact with non-indigenous people and teaching her not to be afraid to ask questions. While parts of the story is extremely poignant, I am in two minds about the narrative technique. It’s mostly Lesley’s first-person story with occasional commentary from Tammy, either continuing the story or clarifying what’s been said. It’s not exactly a conversation though from time to time, Tammy asks her mother questions or makes a teasing comment. Towards the end of the book, there is more of Tammy’s story as she embarks on her role as a Youth Ambassador to the UN, and Lesley’s voice becomes more reflective. However, it is made clear from the outset that Tammy has recorded her mother’s story and shaped it into the book. Tammy explains that her mother’s inability to write her story wasn’t just self-doubt and a lack of education, it’s also that Lesley is a product of an ancient oral story-telling culture and so it made more sense for her to tell it rather than write it. Not Just Black and White is an inspirational story about an issue we should all know more about. Highly recommended. To find out more about the David Unaipon award, visit Sue’s post at Whispering Gums, or to buy some of the award winning titles, visit the publisher, UQP. Natalie Platten reviewed Not Just Black and White for Readings, and you can read a little bit more about the authors at The Age. Have a look at this video about The Ration Shed in the Cherbourg Historical Precinct as well. Source: Personal copy, purchased from Amazon. I hope stories like these are widely read Lisa. We have huge gaps in our understanding and knowledge because of ‘official’ history denying for so long all the terrible treatment meted out. The ABC has just broadcast an insightful program on how wages and welfare payments were stolen. So many govt bureaucrats and others complicit in disgraceful exploitation. Was that ABC program radio or TV I wonder? I don’t know, I’ve scoured IView for it so far unsuccessfully, but sometimes they take a while to put it up. Agree re reading a personal story. It’s amazing, isn’t it? I don’t know how they can justify it to themselves. Thank you for your review of the memoir, Not Just Black and White by Lesley and Tammy Williams. The issues that the authors address such as labor exploitation, racism, child abduction, single-motherhood, and poverty are very important to address nationally and globally. I look forward to acquiring and reading the memoir. Lisa, you brought up the issue of authentic voice which is very important to the literary subgenre of autobiography/memoir. This issue brought to mind the autobiography Aunty Rita written by mother and daughter- Rita and Dr. Jackie Huggins. I distinctly remember Rita’s authentic voice being ever present and Dr. Huggins interceding in moments throughout the autobiography to support a point Ms. Huggins made or expand on social, cultural, and political issues relevant to her life experiences. Dr. Huggins’ essay collection Sister Girl also highlights the social, cultural, and political aspects of life for Australian Aboriginal women. Thanks for this, I’m sorry I missed replying to it earlier. I met these two women during the week when we all appeared on 3CR’s Published… Or Not program, with Jan Goldsmith and David McLean. Fabulous women, strong women, articulate women. I will be reading this book, and tweeting this review! Hi Jenny, is there a link where we can hear the program online? Why yes there is, now that you ask! Thank you for bringing this review to my attention Lisa. While I don’t specialise in this area of history, I am not aware of any other memoir that has such a close look at the issue of stolen wages. Another one for my groaning TBR pile! *chuckle* We all do that to each other, eh? Thanks, Jonathan, I’ve been browsing your blog (and getting sidetracked all over the place, as we do) because Kim from Reading Matters recommended it. (See the comments in my recent post https://anzlitlovers.com/2016/11/06/a-new-home-for-poetry-reviews-messengers-booker/). I love the serendipity of the litblog universe! As you know, Lisa, it’s always nice when someone browses and comments. I hope you enjoy what you find. I have indeed enjoyed myself. But the day is no longer young so I must shut down the laptop and get on with things! Actually, it wasn’t Kim from Reading Matters but me, Lisa!! I’ve been reading Jonathan’s blog for years. You’re forgiven. I don’t mind being mixed up with Kim! Two of my favourite bloggers, but *blush again* totally distinctive.